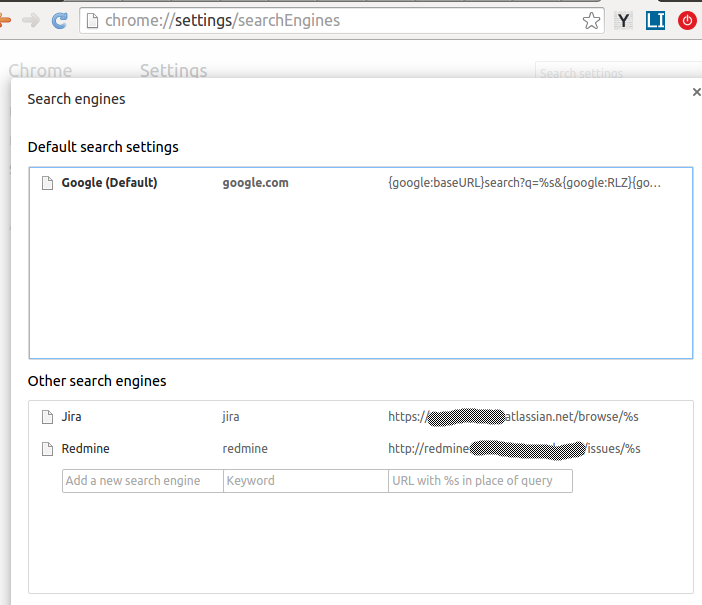 I knew for pretty long time existence of Chrome custom search engines but just now got a huge benefit of it. The idea is that you can define custom keyword to do a "search" in some website. What you do is you define a keyword "engine" and then when you type "engine keyword" browser will redirect you to custom specified url with substituting %s with your keyword. What I use is to access our redmine and jira systems. I have defined custom keywords "redmine" and "jira". So now when I type "redmine 15472" I got redirected to redmine issue. Same with jira. This is very convenient and I really recommend everyone to use this trick. Same thing exists on Firefox.